This program replaces the existing SPESFEED Version 8 for DOS, which has found widespread application on farms, in feed mills, at universities, and by professional nutritionists throughout the region. By combining the new with the old, SPESFEED EXPRESS has become a system that is easier to use than ever. SPESFEED EXPRESS can be used as a part of a larger feed formulation system. It is possible to interchange data and formulations with Format Internationals’ NC system. The logic flow used in the original program has been retained, but the full power of Windows has been harnessed to improve the data manipulation, report writing and screen layout. It is based on Microsoft’s SQL, which means that it runs on a relational database which in itself brings huge advantages in terms of data handling. In order to run it has a few specific requirements. It will run on Windows XP (service pack 3), Windows Vista for Business or Windows 7 Home Premium or higher. 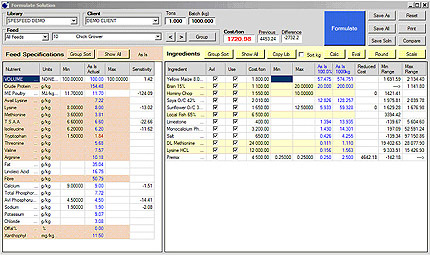 The key feature of the SPESFEED EXPRESS program is the Formulation Screen. This screen provides the use with all of the information required when formulating a diet. In addition, it is possible to make changes to the input parameters and to carry out “what if” analysis. It is also possible to “hand drive” a formulation and to see the consequences of any changes that are made to the formulation in terms of cost and/or nutrient analysis. All reports can be exported to an Excel spreadsheet, which means reports can either be changed, or saved as PDF files and emailed.